If you've never tried paper-piecing, or just love it, join our tulip class! These spring beauties bloom year round and do well with zero watering! Seriously though, foundation paper-piecing is an easy way to get perfect points and sew small pieces, we'd love to show you! 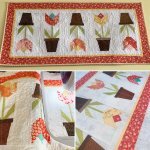 Kits include fabric for one tulip block and a printed template. Pattern booklet must be purchased separately.